October 28, 2012 - During the annual AOPA (the Aircraft Owner's and Pilot's Association) meeting in Palm Springs, CA, Summit Aviation was one of five flight schools to receive the Flight Training Excellence Award for Outstanding Flight School. The award was created to recognize flight schools that contribute to an optimal training experience and encourage flight training best practices. They are based on AOPA's flight training student retention research that identified 47 distinct elements that contribute to the best training possible. Ben Walton, Summit Aviation owner said, "I am proud to accept this honor on behalf of our team of top-notch professional staff and instructors, and especially our Chief Instructor Janine Nunes, who spearheaded our growth with Montana State University and with the Veterans' Administration, which allows for the training of Veterans looking to pursue a career in aviation to use their benefits." In addition to providing flight training for MSU’s successful Aviation Degree Program, which has experienced 75% growth in the past two years, Summit also provides individually-tailored flight training and specializes in mountain flying courses which are led by Summit founder and mountain flying expert, Ben Walton. Summit flies state-of-the-art Diamond airplanes which feature the latest avionics, carbon fiber airframes, and highly efficient Jet fuel powered engines. Diamond airplanes have proven to be the safest training aircraft in the world with the lowest mishap rates of all general aviation aircraft. Summit Aviation also encourages public outreach to build the flying community with summer day camps for students, the EAA Learn to Fly Day, and open house days. Summit Aviation is an FAA approved flight school, aircraft charter and sales company located at Bozeman Yellowstone International Airport. 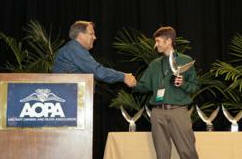 The AOPA award committee received over 2500 nominations for this award.